Size: 15 x 15.8 x 1.8"
15 x 15.8 x 1.8" 25.6 x 15.8 x 1.8"
The PL-E60DS Portable Bi-Color SMD DMX LED Panel with V-Mount Battery Plate from SWIT is a low-profile fixture with a thin 1.8" design and a 70° beam angle for wide coverage that can be contoured and controlled by the included 4-way barndoors. Color temperature is variable from 2700 to 6500K or anywhere in between to match prevailing ambient light conditions, other fixtures, or to work creatively without resorting to filters. The high CRI: 98, TLCI: 99 rating ensures the accurate rendition of color. Light intensity is also variable from 0 to 100% without flicker. Both functions can be adjusted on the fixture. You can also make adjustments remotely from a console via onboard DMX. Settings are displayed on the large, easy-to-read LCD screen on the back of the light. The PL-E60DS runs on the included AC adapter, but it can also run on optional V-Mount batteries when mains power is unavailable. The PL-E60DS LED Panel employs surface mounted LED technology and includes 320 bright LEDs. 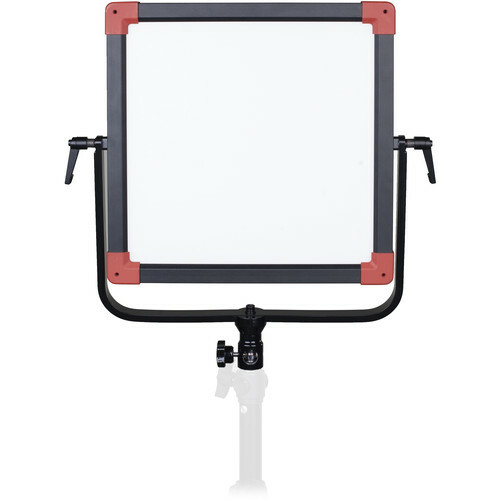 The built-in diffuser generates an even 70° beam spread for effective wide coverage, which is ideal for broadcast studio and field video productions. Color temperature is adjustable between 2700 and 6500K or anywhere in between. You can make adjustments locally on the fixture or remotely from a console via onboard DMX. The PL-E60DS consumes W of power and supports smooth 0 to 100% digital dimming without flicker. CRI (Color Rendering Index) is a measure of the ability of a light source to reveal the colors of various objects faithfully in comparison with a natural light source. TLCI (Television Lighting Consistency Index) is a special rating for color revealing ability by the camera sensor. 100 is the maximum rating. The rear LCD screen can display the current dimmer percentage and color temperature values. The light supports a 11-36 VDC 4-pin XLR input and is equipped with a V-Mount battery plate to power it with an optional V-Mount battery or by the included AC adapter. 4-Way barndoors allow you to light the areas that you want to and keep light from areas where you don't want it.